Dr. Tonyatta Hairston is a native of Jackson, Mississippi. She received her Bachelor of Science Degree in Biology from Tougaloo College in Tougaloo, Mississippi. 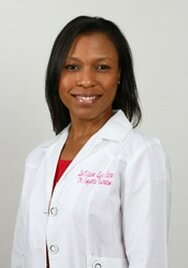 Dr. Hairston attended Southern College of Optometry in Memphis, Tennessee where she graduated with honors. While at SCO she was a Dean's List Student, recipient of the Clinical Science Award, Student of the Year, and Gold Key International Honor Society President. 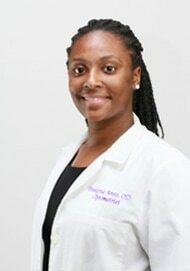 She studied at externships including Keesler Medical Center in Biloxi, MS, Dr. Dewey Handy Optometry in Jackson, MS, and Dr. Watts Davis in Laurel, MS where she was trained extensively in the treatment of ocular diseases, contact lenses, pediatric optometry, and pre and post-surgical eye care. Dr. Hairston was also named Mississippi's Young Optometrist of the Year and is a member of the 2011-2012 Class of Leadership Greater Jackson. Dr. Hairston is serving in her provisional year with Junior League of Jackson. She also is an Adjunct Professor for extern students from Southern College of Optometry in Memphis, TN and the University of Alabama, Birmingham, AL. Additionally Dr. Hairston engages in public speaking on topics related to eye care and entrepreneurship. Some of the ventures she has spoken at include but are not limited to the following: Southern College of Optometry, Mississippi Head Start Conference, The West Jackson Rotary Club, Tougaloo College, Entrepreneur Leadership Training at Jackson State University, and The University of Southern Mississippi. Dr. Trakena Jones is a native of Macon, MS. She received her Bachelor of Science Degree in Biology from the University of Southern Mississippi in Hattiesburg, MS. Dr. Jones received her Doctorate at Pennsylvania College of Optometry at Salus University in Elkins Park, PA where she graduated with honors. She was inducted into Beta Kappa Sigma Honor Society while attending PCO. Dr. Jones completed externships in Primary Care Optometry at Dewey Handy Optometry in Jackson, MS Contact Lenses at Bossier Family Eyecare in Bossier City, LA Low Vision Optometry at the Feinbloom Vision Rehabilitation Center (The Eye Institute) in Philadelphia, PA and Ocular Disease at the Veteran Affairs Medical Center in Salisbury, NC. Dr. Jones completed her residency at the University of Alabama at Birmingham School of Optometry in Low Vision and Geriatric Optometry in Birmingham, AL. Dr. Jones received hours of training in vision rehab, congenital and acquired ocular disease, pre and post op care, and research. ​Dr. Jones loves spending time with family, cooking, and exercising. Her favorite thing to do is riding four-wheelers through the woods of her parents' and grandparents' farm!